For anyone who has worked in radio, looking at this is like watching your life flash before your eyes. This young lady is spooling up. It used to be an utterly physical process. The worst thing that could happen was if the sticky tape holding your cuts together came off and your work would literally fall apart in front of your eyes. We used to stick the cuts up on the wall with clothes pegs in case we wanted to use them later. You had to be careful with the razors because if you got blood on your reel it could really mess with your audio. Contents From the editor... My generation has grown up at a time when the lessons of our forebears can seem to have no relevance in the ultra-digitised now. We’re accustomed to the fast clip of a 24-hour news cycle. It’s exciting and, equally, disheartening. It creates an environment in which technology and ideas are supplanted before they can incubate. 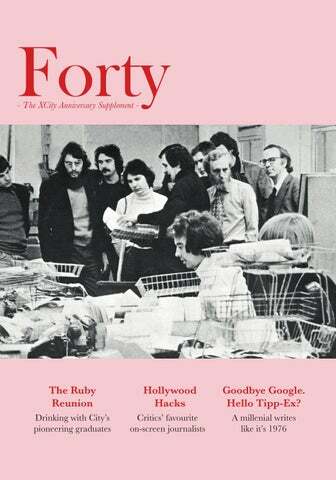 So creating this supplement for the 40th anniversary of the journalism department was a lesson in legacy. It was a scavenger hunt of archival photographs and scanners, coming face-to-face with typewriters and telephone booths (p16) and learning the origins of the term “to spike” (p10). We took on yesteryear’s technology and, somehow, prevailed. But more importantly, we met the journalists who laid the foundation for our studies and (hopefully) our careers. We spoke to lecturers and alumni about their experiences and opinions amid an uncertain media landscape. We peeked back to a time when the university caught fire (p9) and shorthand was fundamental (p6) and gathered indispensable advice like “never punch your colleague” (p18). We also looked forward – to a future of virtual reality and robo-reporters (p14, 19). Many of you lamented a lost golden age of journalism, but we think there is room for a platinum era that pools a plethora of tools, old and new. We extend a warm thank you to the lecturers and alumni who answered countless queries and to City University London archive, for providing photographs and helping us with our research. We hope you enjoy this nostalgic and pocket-sized XCity supplement. The journalism department opens its doors to 13 students for a diploma. Tom Welsh is City’s first director. The Graduate Centre for Journalism is founded. Lecturer Henry Clother instructs his students. + Diploma in Radio Journalism + International starts with just and Periodical five students. Diplomas start. John Dodge is the department’s first professor of journalism. + Journalism Postgraduate Diploma (PGDip) is launched. Sixty typewriters get thrown out in favour of Amstrad PCWs. Prof Hugh Stephenson becomes head of the Graduate Centre for Journalism. Fire breaks out in the College Building, closing portions of it for two years and causing £10m in damage. CNN incorrectly reports that it destroyed the journalism department. 2006 2003 2004 2008 2005 + The department’s Broadcast Journalism PgDip is launched. + Periodical Diploma becomes Magazine Diploma. Prof Adrian Monck takes over as head of journalism. + Erasmus Mundus Journalism, Media and Globalisation PgDip begin. + MA in Investigative Journalism is launched. An early iteration of XCity is born with the title of Newsletter, published using Amstrads, a few IBMs, the Ventura Publisher package and a laser printer. The Graduate Centre for Journalism is given departmental status. + Broadcast Diploma is launched. Prof Hugh Stephenson leaves after 10 years. Professor Rod Allen takes the helm. Journalism at City celebrates 20 years with wine, food and “no speeches”. The Journalism and Social Science BAs (Hons) accept their first students. 2000 1997 + PgDip in Electronic Publishing is launched. The BA in Journalism and Contemporary History delivered jointly with Queen Mary University of London starts with 20 students. £12m journalism wing opens in the College Building with a TV studio, four radio studios and five newsrooms with 78 Macs and 67 PCs. Prof George Brock, managing editor of The Times, replaces Adrian Monck as head of journalism. + Science Journalism MA launched. 2010 + Political Journalism and Financial Journalism MAs begin accepting students. The Bureau of Investigative Journalism opens at City. 2011 2014 + MA in Interactive Journalism is launched, led by newspaper course director Jonathan Hewett. The department spends £450,000 on new television facilities, including a high-definition green screen studio. 2016 Prof Suzanne Franks (above) to take over as head of journalism from Prof Michael Bromley, who has been interim head since 2015. Department has 523 enrolled students. The original group of graduates take a trip to County Hall, which housed London’s administration and local government. From left: Tom Welsh (with back to camera), Jacky Law, press officer, Peter Kendall, Terry Dignan, Sarah Hawksworth and Steve Howell. today – and left City two years after launching the course to edit the North West Evening Mail at Barrow-inFurness, Cumbria. “He thought journalism was essential to a liberal democracy,” says Terry Dignan, formerly of the BBC and host of the Radio show Westminster Hour. “He was all about challenging the establishment.” Welsh remained in close contact with the first City graduates, whom he lovingly nicknamed “the famous class of ‘76” (though they graduated in 1977). He is at the heart of their reminiscence on this sun-flecked Friday in Islington. Graduates listed in red attended the 2016 reunion. Jon Slattery and Jacky Law reminiscing at the 2016 reunion on Upper Street. ver the course of the five-hour reunion, the wine flows from bottle to glass to belly to cheeks. By the end of the evening the group has decided to meet next year – this time in Paris, where their classmate Sue Landau lives. Their nostalgia is celebratory. They are unique in having come to journalism on the brink of the computerised revolution, which irrevocably altered the practice, its methods and its milieu. While the majority think the heyday of journalism has come and gone, others seem more hopeful. “Journalism can still be heroic,” says Slattery. “It’s not all clickbait and cynicism.” Slattery’s blend of scepticism and hope seems an echo of Welsh’s pioneering spirit – a spirit that laid the foundation for a 40-year-strong institution that has seen the matriculation of 6,984 alumni from all over the world. “We grew up as journalists with Tom,” says Bayliss. “It would have been nice to see him here today,” says Slattery with a sigh. The pub is a common thread in their anecdotes, as is the smoke-filled pandemonium of old newsrooms. “One of the differences with journalism today is the silent computerised space,” says Kendall. “When we did it, there were clouds of smoke and stale aromas.” “Some of us do not feel nostalgic about that,” laughs Robin Wills, who has worked on the BBC World Service and now is a practising psychiatric social worker. “What would you prefer, a news editor who smoked and was content or who was not allowed to smoke and became a psychopath?” says Dignan. “There is a distinct lack of banter,” says Smith, echoing others’ unease with the hushed modern newsroom. “What is being in a newsroom all about if there’s no banter?” And though the class of 1976 are a banterous bunch, they are equally well-armed with valuable and enduring do’s and don’ts of the profession. “The best journalists are the drunkest journalists,” jokes Smith, with perhaps a hint of sincerity. Bottom: Peter Kendall; Sarah Bayliss at Le Mercury in Islington. Top right: The class shares a meal with Tom Welsh in 2009. Anna McKane, former head of undergraduate journalism, recalls the day fire struck City University on 21 May 2001. The day before, I’d set my newspaper students a running story task about a fictional fire in a store on Oxford Street. Can you believe it? On the evening of the fire, at around 9pm, a student rang me and said, ‘Anna, fire is sweeping City!’ I said, ‘Oh pull the other one’ and she said, ‘No, really!’ I rushed to see it immediately. It was unbelievable. Even at Exmouth Market you could see flames right up in the sky from behind the buildings. It was an extraordinary sight: the firefighters, the fire engines, the flames leaping in the air. When the fire took hold of the wooden beams on the roof it went off like a rocket. The building looked like a bonfire. There were a lot of people watching: I met some students outside and we marvelled at it together. It sounds awful, but a fire is exciting to witness. Let’s face it, my students studied journalism and there’s a great story in a fire! Then: 1976 Your press card was the respected and necessary passport to hot news and nice perks. Without press union membership your copy could be “blacked”. In the time it took to dial this bad boy, you could smoke a cigarette, take a shot and volley a few lines of banter. Pages divided and filled with scrupulous Teeline shorthand notes describing oddball sources. Google Advanced Search, circa 1976. Bottled inspiration… and occasionally the cause of a botched interview or “stolen” notebook. When paper was key, the clip was king. No stapling allowed. 20 (or more) for every barely-met deadline. This trusty steed had no delete key to save you when you fell off. Desks littered with used Tipp-ex papers. The final resting place for truly atrocious copy – and the origin of the phrase “to spike”. Cruel, yet satisfying. Now: 2016 To drown out the sound of other people drowning out the sound of you listening to a Radio 4 podcast. Ticket to glitzy events and free snacks. Nice, but not as necessary as it once was. A portable and versatile mainstay of modern journalism – complete with a glowing emblem of consumerism. This magical interview capturer is the scourge of shorthand. This overpriced, nocturnalityinducing stimulant helps you keep up with the 24-hour news cycle. The ear mic is the dictaphone’s indispensable sidekick – the Samwise Gamgee to its Frodo. Social media machine. Occasional source of thumb aches and phone phobia. Dead wood, but a necessary tool. A dictaphone can’t capture colour. You have evolved to sniff out a socket for this lifeline from up to 20 metres away. Hollywood After Spotlight won an Oscar for its portrayal of hard-nosed investigative journalism, Ben Allen and Adam Chapman asked film critic alumni: Who are your favourite on-screen journos? The true story of the Boston Globe’s team of investigative journalists who exposed the cover-up of mass child molestation in Boston’s Catholic Church. Crowe chronicles the escapades of 15-year-old William Miller, a young music journalist hired by Rolling Stone magazine to tour with an up-and-coming rock band. One of director Alexander Mackendrick’s finest is this tale of a renowned newspaper columnist who uses his power to sabotage his sister’s relationship. Raoul Duke (Johnny Depp) is in Las Vegas to report on the Mint 400 motorcycle race, but he finds more material in a psychedelic haze. Is citizen journalism democratising the industry? It is good for democracy but not journalism. I don’t necessarily miss the days when a critic would pontificate from on high, and it is interesting now to hear what people think. But it’s not journalism any more than somebody on TripAdvisor telling you their hotel room is a bit small. That is just somebody’s opinion and we’ve all got one. McIlheney is chief executive of the Professional Publishers Association. He worked as executive director at FHM and launched Heat and Zoo. Where do you see print in 40 years? I think print will always have a role to play. The printed version of a magazine is incredibly special, particularly for glossy magazines. For us it’s quite exciting because print is holding up the market really well. You’ve got digital editions, you’ve got events, you’ve got social. Will people continue to pay for content through print or online? People forget that every month 200,000 people pay £4.20 to buy a copy of Vogue, and there is a world of difference between that and clicking on a picture of a kitten for 10 seconds. It’s free but it’s not engagement. Content is a different world from millions of people spending a nanosecond looking at a skating dog. There are more people pinching our content than ever before and in 40 years’ time I suspect that will only grow. Will more people be consuming content in print? Probably not. Will more people be consuming it on a screen yet to be invented? Probably. Will they be consuming it on a chip that is going to be inserted into your brain? Possibly. Where do you think the money for journalism is going to come from 40 years from now? There are lots of different models. Some are lucky to have private owners with a lot of money. Some, like The Guardian, are lucky to be essentially a charity. Some people are generating a lot of money through native advertising, through paywalls on subscription models and through old-fashioned cover prices. Evans founded Explaain in 2014. It is an interactive app that breaks news into snappy and straightforward content. 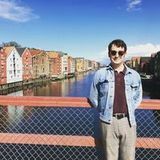 He teaches on City’s International Journalism MA and was listed in Forbes’ 30 under 30 Europe Media Class in January 2016. In 40 years, will people still pay for news? Now that we don’t have to pay to get news I don’t think this will be reversed. There are other ways of making money apart from paywalls and selling your content directly to the readers. The main way this will happen is by microtargeting, like on Facebook, where users are sent advertisements based on their individual preferences and what they’ve viewed before. We are a clever, innovative bunch and I am confident that we will find a way. As long as we produce content that makes people want to spend time on it then it matters less to me what particular format that’s in. Will digital content begin to outweigh print content over time? People get obsessed with this either/or, print v digital. It’s print and digital, events and data, and so on. Every day, I spend 20 minutes reading the paper on the bus and 15 minutes on my phone looking at Twitter. Will print be dead 40 years from now? I think more or less. The Independent is being smart by going digital-only now. The ease of access and the experience of reading news on a device is only going to get better. I think people will pay for specialist news and magazines will no longer be part of the mainstream. Lang has worked as a foreign correspondent for the BBC in Eastern Europe, reporting on the 1989 revolutions and the wars in former Yugoslavia. She presents on BBC Radio 4’s arts and culture programme, Front Row. What role will virtual reality play? I think virtual reality will be a big part of journalism, specifically when a journalist produces an immersive feature that readers can really get stuck into. Articles will have more media elements and documentaries will have more interactive elements. Even now it’s really easy to cheaply experience virtual reality. Google Cardboard is a virtual reality accessory that you can add to your phone, and it’s just 10 or 20 quid. In the future there will be a completely new interface for how we access our information. When you started out as a journalist, did you think radio would have enduring appeal? Not at all, it’s extraordinary that radio is doing so well. Our listenership across the week is around two million people. I think podcasting in general has become popular with the arrival of the smartphone. It allows people to listen while they do other things such as travelling to and from work. Are there any traditional journalism practices that have become obsolete? When I first started radio I was literally cutting bits of tape. Now I can film something broadcast quality on my iPhone. The change is unimaginable. Television and film have become far more democratic. Because everything has become easier, anyone can go out and make a perfectly good short film. How will the role of the journalist evolve? In 40 years, I don’t think there will be enough money to pay journalists to go down to the courtroom just to get some quotes. That can be automated. The place for journalists will be in analysing that information. Right now we’ve got a huge information overload but the average consumer doesn’t want to spend time sifting through those facts. Will print still be revelevant in 40 years? I think so, but in order for it to survive we will have to be more inventive. My husband wrote a book about cyber crime which didn’t sell many copies, but unexpectedly he has since found a whole new income stream giving live talks about it. What he gets paid for is live performance. One of his books is also being made into a drama series and quite a few former colleagues have turned real life stories into film and television scripts. When thinking how journalism might make money, we have to think outside the box. How do you envision this automation of news? When someone says something in a courtroom or Parliament, for example, the whole speech will be automatically transmitted to newsrooms that subscribe to them rather than journalists going there to take notes. I think there will be a general trend towards breaking up data through automated processes and sending it to journalists without any human intervention. Is citizen journalism democratising the industry? I am quite cynical about this and don’t think it’s becoming more democratic. There’s a very worrying divide that is opening up whereby large corporations, banks and hedge funds actually fund their own newsgathering operations. On the other hand, people want everything for free and are not prepared to pay for content. We have a situation where the very wealthy and powerful have access to information that the rest of us don’t have. What does this mean for longform journalism? Many people are talking about how robots will be writing articles soon but I think we will eventually see the decline of the article itself. We will be consuming information in very small chunks of content, like a quote, a statistic or a profile. What, if anything, will stay the same? Investigative journalism, because access to information will, in general, be much easier. The skills that investigative journalists need – the drive and skeptical mindset needed to pursue a story – will remain the same. I don’t think these skills can be replaced by technology. Patch Day is a breeze. Nowy Connect’s new app allows reporters to define the kind of sources they’d like to meet and suggests people nearby that fit the description. Rather than accosting the local florist for stories every Thursday, the sources will come to you, with a notification if someone newsworthy walks by. Innovation and research company Stylus predicts that everything from transcriptions to booking cabs will be done by a virtual PA. “Truth Goggles” are already weeding out untruths on web pages. Think meetings arranged, expenses sorted and lunch booked for that big interview.